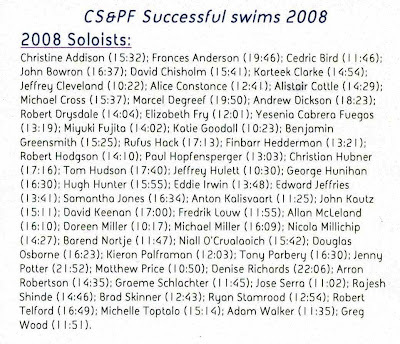 Above: The menu and list of CS&PF Solo Channel Swimmers for 2008. Arriving in Dover on Saturday evening with my wife Beccy and 'Little Hoffy', it felt like we had never been away. Sweeping down past the harbour from the A20, I gazed across the harbour and thought about all the lengths back and forth over the past couple of years. The sun was just setting and the water was as calm as it could possibly be. If it wasn't for the fact the water was only just over 7 degrees Centigrade, it would be a perfect evening to swim the channel. However, we weren't here for that today, we were here for the annual dinner and awards presentation of the Channel Swimming & Piloting Federation (CS&PF). The tables were all excellently set out, and the dinner committee had obviously been working very hard all day, probably all week or longer in fact, to ensure that everyone would enjoy themselves. Charlie Gravett, who will be my pilot for my Jersey to France swim when it eventually does take place, had been elected as Chairman of the CS&PF for 2009 earlier in the day at the AGM. Well done Charlie, I'm sure you will do fantastic job. It was during a chat with him prior to sitting down for the meal, that reality struck home about my Jersey to France attempt for 2009. You may remember that we went to Jersey in 2008 for the attempt, but despite sitting there for the week, I could not swim due to the windy conditions. We returned back to England, and re-booked it for the week commencing July 01, 2009. Well, things don't always turn out as planned in open water swimming. Beccy is due to give birth on July 29, 2009. That's 29 days after the planned swim! So after discussions with Charlie, Beccy and I have reluctantly decided to cancel the swim at present, as there is no way she can spend hours on a boat feeding me when she will be 8 months pregnant! We will have to re-schedule it, probably for 2010. Back to the meal. "First, thank you to everybody who turned out on Saturday night for the CS&PF annual dinner. By all accounts everybody really enjoyed themselves. Amongst the many highlights for me were: Ros Hardiman's award and the spontaneous and prolonged standing ovation she received; the composure and strength Tara and her family showed in presenting the Leo Cox award; Frank Richard's heartfelt words on accepting his retirement award and how he said his priority now was to look after Margaret like she has looked after him all their married life and that she was far more important than Channel swimming - true love still after 61 years; introducing all the solo Channel swimmers from last year and, hearing after from someone who swam two years ago that one of the things that spurred him on during his swim was that he wanted to stand up and be introduced at the dinner as a Channel swimmer; and, the aah moment of the evening, when Frances Anderson stood to accept applause for her swim last year and it was announced that her boyfriend 'Shep' had taken her to her landing point in France earlier in the day and proposed to her at that spot. Of course Evelyn winning the grand - let's say huge - bottle of wine was also a highlight - can't wait for THAT Varne Ridge barbacue in the sunmmer. And, there were over 40 swimmers braving the harbour on Sunday morning. The lovely sunny day belied the freezing water temperature (not that I would know, before anyone comments!) and shifts of ten at a time swimmers descending on Chaplin's for breakfast reminded me of days gone by and both delighted and challenged Barbara in the kitchen. But, the main reason for penning this is to say that buried in the PDF Mike sent last night was the figure for the amount raised on the night for the Dover Lifeboat. £516 was collected (thanks Ella and Rhianna for collecting the envelopes) and will be presented to the RNLI Dover Lifeboat and thanks also to the emergency committee meeting convened during the evening (well a few of them gathered round Charlie's Guinness and did a thumbs up) when it was agreed that the CS&PF will match that amount and present a cheque for the euro equivilant to the Calais Lifeboat. Thank you to everyone for your generosity. So to next year with the small matter of a whole season's Dover training and Channel swimming to come first! A big well done from all of us here in Bury St Edmunds to Cliff, who was an excellent compare for the evening. Above: Meeting my 2 Way Channel Swim 2010 pilot Eddie Spelling for the first time. He gave me some valuable information. Above (Left to Right): Little Hoffy, Sonia from The Sandown Guest House, Me, Beccy. Above (Left to Right): Channel Swimmers Benjamin Greensmith, Ned Dennison, Me (the short one at 6 Feet 1") and 2009 Channel Swimming Aspirant, Mike Hall. Having indulged in the usual excellent breakfast served at The Sandown by Sonia, we set off for the beach on a glorious almost Spring day. When we got there I was amazed at just how many mad fools were there! There must have been 50 or so people all eager to get in the 7.8 degrees Centigrade water. All except me actually. I really was not in the right frame of mind to get in. I was still thinking about my cancelled Jersey swim. At the beginning of the year, I had 3 big swims planned. Now, I had none! I stripped off and headed down to the water. Above: With multi-channel swimmer, Nick Adams who helped me so much last year in Dover Harbour. I stepped into the water up to my shins, and had the most searing pain shoot up my legs imaginable! Many people just went swimming off to the Prince of Wales Pier and Back. Nick Adams swam towards the Eastern Dock. Try as I might, I just could not get in. My head was not quite in the right place. Eventually I resorted to splashing the water all over my body with my hands. This helped a lot, and without further ado, I walked into the water up to my waist. It's amazing how the brain works. I was thinking, that there really was no point in doing this this year, I now had no reason to as I had no swims. I swum back to shore, and watched the others. Nick Adams did an amazing swim almost to the Eastern Dock and back. Above: Pleased with myself after the best part of 60 second in Dover Harbour! Above: Me with channel swimmers Sam Jones and Carlos. Apologies Carlos, but I don't think I've ever been told your surname! We set off back to Bury and while I sat in the car, I sat thinking, pondering things, wondering when I would be back in Dover. A good weekend, but a lot to think about.